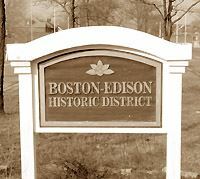 The list of the historically significant residents of Boston-Edison, some with biographies. A short history of the first homes built in Boston-Edison, in 1905. Resources for researching a home's history for homes in Boston-Edison. Neighborhood tours of Boston-Edison, including historically and architecturally significant houses. The Boston-Edison Historic District consists of a 36-block area containing approximately 900 houses. The District is bordered by Boston Boulevard on the North, Edison Avenue on the South, Woodward Avenue on the east and Linwood on the West. The earliest individual ownership of the land tracts within the boundaries of Boston-Edison can be traced to a grant made by the Territory of Michigan to John R. Williams (an early mayor of Detroit, after whom John R. Street is named) in 1822, and three grants made to Thomas Palmer (of Palmer Park fame) in 1828 and 1834. The land in these four grants changed hands multiple times over the next 50 years, until they came into the hands of the Joy family, the Newberry family, and Edward Voigt. The Boston-Edison area was designed and developed by some of Detroit's most prominent turn-of-the century citizens. Edward Voigt foresaw the logical growth of Detroit along Woodward Avenue and began acquiring land as early as 1884, platting the area between Woodward and Hamiliton (Voigt Park Subdivision) in 1891. Voigt Park Subdivision was incorporated into the city limits in 1891 with Hamiliton being the city line. 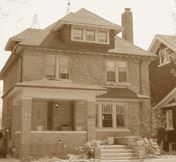 The first homes in the current Boston-Edison historic district were built and occupied in 1905. Voigt established the character of a new residential area by designing boulevards and streets, establishing building restrictions that assured a mix of palatial homes and substantial housing on spacious lots and setting aside land for a park between Second and Third, Longfellow and Edison -- now known as Voigt Park. The initial pattern developed by Voigt was followed by subsequent prominent citizens in their subdivision development. In 1913, Truman and John Newberry developed the Boston Boulevard Subdivision between Hamilton and 12th St. (now Rosa Parks). Two years later, Henry B. Joy designed of the Joy Farm Subdivision, stretching from 12th Street to Linwood. Both the Boston Boulevard and Joy Farms subdivisions were annexed by the city in 1915. The Historic District is a superb example of the progressive ideals of urban residential design during the early 20th century. Visual delight is provided by diversity of architectural styles counter-balanced by a sense of harmony achieved by uniformity of scale, roof line and set-back and by consistent use of stone or brick construction. The American penchant for individuality is evident in the fact that out of over 900 houses, no two are alike; each is custom designed and is a unique interpretation of its chosen style. The eclecticism so enthusiastically embraced during the first quarter of the 20th Century finds exuberant expression here. Styles include English Revival (Cottage, Tudor, Renaissance), Roman and Greek Revival, French Provincial, Colonial Revival (Georgian and Dutch), Italian Renaissance, Prairie and Vernacular. The majority of houses were constructed between 1905 and 1925 and range in size from mansions set amid extensive grounds to two-story vernacular houses situated on forty-foot wide lots. However, regardless of size, each home reflects the high level of craftsmanship and quality of building materials typical of the time. All homes are at least two full stories, built of brick, stone or stucco and set back at least 30 feet from the front lot line. Many homes feature cut stone details, elaborate door surrounds, slate or tile roofs and leaded glass windows. From its inception, Boston-Edison was designed to be a quiet, sedate residential area. Two boulevards, with amply landscaped islands, course the length of the District, and all streets were originally densely shaded by over arching American elms. Voigt Park provided an additional expanse of green within the increasingly kinetic city and, along with the Ingleside Club, was a focus of neighborhood social life. The original character of the neighborhood is, to an amazing degree, preserved to this day, and the ambiance of a less hectic and more sedate time can still be captured on an autumn stroll across the park or a summer walk down a boulevard. During the first quarter of the 20th Century, Detroit, largely because of the burgeoning automobile industry, experienced a phenomenal rate of growth. The city, which was 13th most populous in 1900, became the 4th largest city by 1920; area increased from 28 square miles at the century mark to 139 square miles by 1925. Automobile manufacturing brought employment and prosperity to many and great wealth to a few. The development of the Boston-Edison neighborhood paralleled that of the new industry. The rapid phase of growth in the industry began in 1903 with the establishment of the Ford Motor Company and accelerated phenomenally after the advent of the Model T in 1908 and even more so after the introduction of the moving assembly line in 1913/14. Thereafter, growth and profits became astronomical. The Voigt Park Subdivision was already in place to share in the burgeoning automobile-based economy, and significant Detroit residents began moving into Boston-Edison. Soon, Truman Newberry and Henry Joy, major figures in the Packard Motor Car Company, initiated development of the Boston Boulevard and Joy Farms Subdivision, respectively. Boston-Edison became an enclave of automobile pioneers. When Henry Ford elected in 1908 to build his new home on Edison Avenue, other automobile pioneers followed. Mr. Ford's early partner, James Couzens, built a splendid Tudor mansion on Longfellow (1910). James Couzens served as Mayor of Detroit from 1919 to 1922 when he was appointed U.S. Senator; his son Frank, also a resident of the neighborhood, served as Mayor from 1933 to 1937. Four of the Fisher Brothers moved to Boston-Edison as did Charles Lambert (1911) of Regal Motor Car Co., John W. Drake (1911), president of Hupp Motor Car Co., and W. O. Briggs of Briggs Manufacturing Co. Simultaneously, the Boston-Edison area was also finding favor with prominent members of the increasingly successful mercantile segment of the city's economy. Sebastian Kresge, founder of the S.S. Kresge Company, built a handsome house on extensive grounds in 1914. Subsequently, six other Kresge employees moved to the Boston-Edison area. J.L. Webber, nephew of J.L. Hudson and co-manger of Hudson's Department Store, lived on Edison Avenue. Benjamin Siegel, founder of a major early clothing store, erected an imposing limestone mansion. His cousin, Jacob, Jacob's two sons, Eugene and Joseph, also resided in Boston-Edison. Because no odious restrictive religious covenants bound the neighborhood, prominent members of the Jewish community chose to live in Boston-Edison, including Rabbi Leo M. Franklin, who served Temple Beth El from 1899 to 1950. Boston-Edison was also home to members of Detroit's arts community. Detroit had it first symphony orchestra in 1914, and in 1918 the directors decided to make a permanent appointment for conductor, Ossip Gabrilowitsch, who resided in a handsome house on Boston Blvd. with his wife Clara Clemens (daughter of Mark Twain). Ty Cobb lived on Atkinson just south of Voigt Park where he allegedly played baseball with the neighborhood children. Family ties clearly contributed to the social fabric of Boston-Edison as evidenced by the Couzens, Siegel and Fisher families. Similarly, four sons of the Wagner family, owners of a large bakery concern, resided on Boston and Chicago Boulevards. In addition to being shaped by business, religious and family ties, the social composition of the Boston-Edison neighborhood was influenced by the completion in 1915 on nearby Grand Boulevard of Henry Ford Hospital. Proximity to the hospital and to the Fisher Building (1927) made the neighborhood attractive to many physicians, dentists and pharmacists. Today Boston-Edison is a multi-racial, multi-ethnic neighborhood of more than 900 single-family homes owned by people from diverse occupations and professions. It is governed by the Historic Boston-Edison Association, the oldest continuous neighborhood association in the City, founded in 1921. The District received historic designation from the Federal, State and City governments in 1974. That designation has assisted the district in maintaining its viability as a neighborhood and its architectural distinctiveness. The Association vigorously enforces the local Historic District Ordinance, monitors the issuance of building permits and, occasionally, takes violators to court when City enforcement fails.